Your Guide will meet You dockside at the pre-arranged time You decide to start this tour. 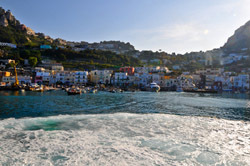 Then, you will be transferred by boat to the island of Capri. 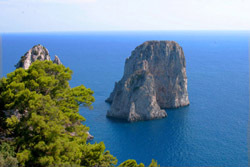 Upon reaching Capri you have numerous options available to You to explore the Island. You could perhaps charter a private boat to circumnavigate the island, or even go scuba diving in the clear and tranquil waters that surround the island. We would recommend the following itinerary through which You can enjoy at a relaxed pace all that the island has to offer the visitor. 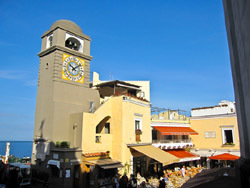 From the port of Capri take the cable-car to Capri town, the most famous of the two towns on the island. We'll visit the Giardini di Augusto, that is a finely planned garden that has delightful views, including the view of the village of Marina Piccola below. After returning to Capri center for lunch (not included), You can have free time to explore the famous Blue Grotto before returning to Naples (or Sorrento) at Your cruise ship, or, even better, You can take a boat for the whole ride all around the island. But for the most adventurous, You can take a hike along secluded paths lined with stone walls and citrus groves to explore the Villa Jovis built by Tiberius, instead of visiting the Blue grotto. 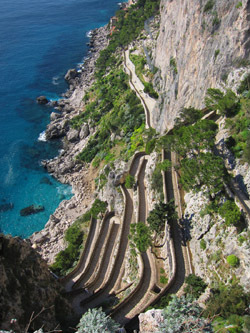 THE PRICE OF THIS TOUR OF CAPRI IS OF EUROS 230. ENTRANCE FEES ARE NOT INCLUDED.